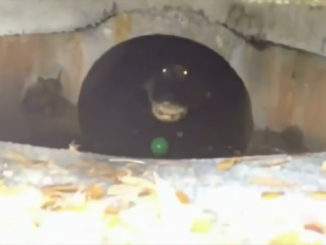 These Things Discovered Deep in The Forest Will Give You The Creeps! 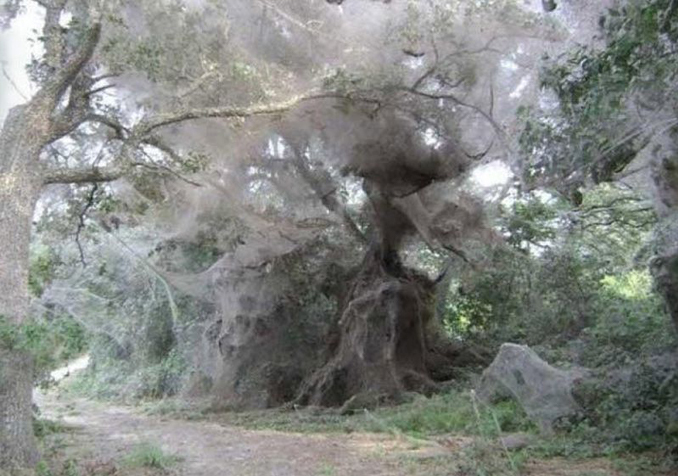 In September, 2007, a huge spider’s web was discovered in the woods outside of Dallas, Texas. While some initially thought the web could have been made by a very large, previously undiscovered species of spider, it was actually found to be a blanket of many webs created by millions of tiny spiders. Scientists found that the web was created by eleven different species of spider, the most prevalent being the Guatemalan long-jawed spider which is about an inch long with a reddish orange head and thorax. The web was believed to be formed by a ‘mass dispersal event’ whereby millions of tiny spiders spin web to ride the air currents which culminated in the giant creepy entanglement seen here. Scientists said that the freak phenomena was most likely caused by an unusually wet summer that had lead to an over abundance in insects, the natural food source of the spiders. I’m not sure which theory is worse? One giant spider or millions of tiny ones? Either way, this situation is the stuff phobias are made of. 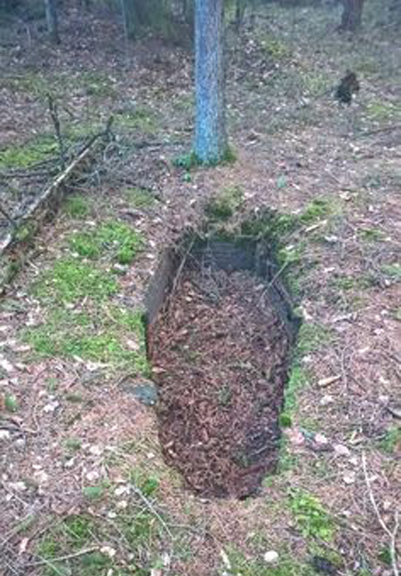 In January, 2015, Reddit user Tafsern posted this photo along with the caption ‘Found something that looked like a coffin in the woods today.’ While there was no indication exactly where the picture was taken, it certainly doesn’t detract from its creepiness. One poster said that it may have been an old grave of an early settler. Perhaps a resident of an old ghost town that had been forgotten over time, swallowed up by the forest. However, the fact that the grave was empty raised more questions. Some posters even speculated that is could be the resting place of a zombie or even a vampire. What do you think this grave was for and why is it now empty? Let us know what you think happened in the comments section below. 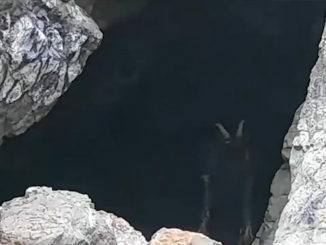 This photo is a still taken from a video made by a hiker. However, there is several sources of conflicting information relating to where it was actually filmed. Some claim the video was taken in the jungles of Indonesia while others claim it was filmed somewhere in the Amazon. Either way, its makes for some very strange footage. In the video, the hiker begins to cross a bridge over a stream. When they reach the halfway point, they pan to the left and focus on a small waterfall. Next, the hiker pans to the right. As they focus downstream they quickly turn away, seemingly startled at what they have just seen. If you slow the footage down, you can see a small humanoid creature standing on top of a large rock in the middle of the river. It has long, slender limbs and large black eyes. 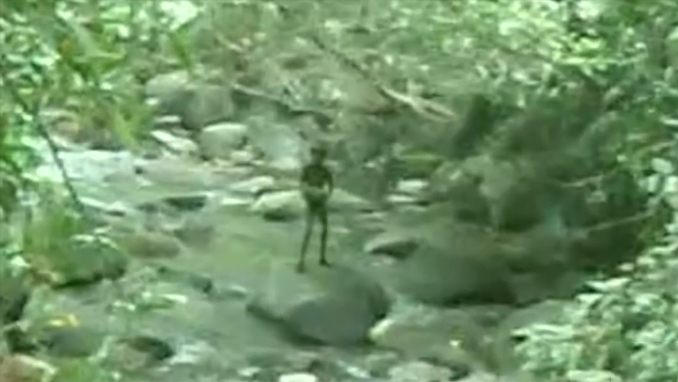 It looks to be wearing dark, tight fitting clothing and its skin appears to be a similar shade of green to the plants in the surrounding jungle. 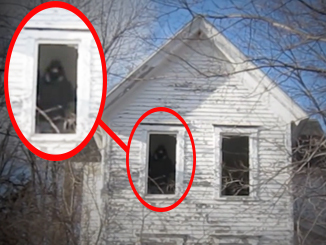 Wherever this video was filmed it is certainly some very startling footage. 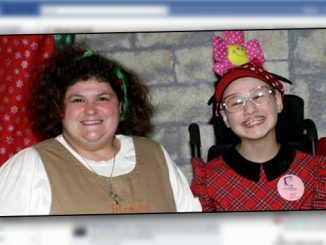 If you know the true location or have any more information about this video, we would love to hear about it. 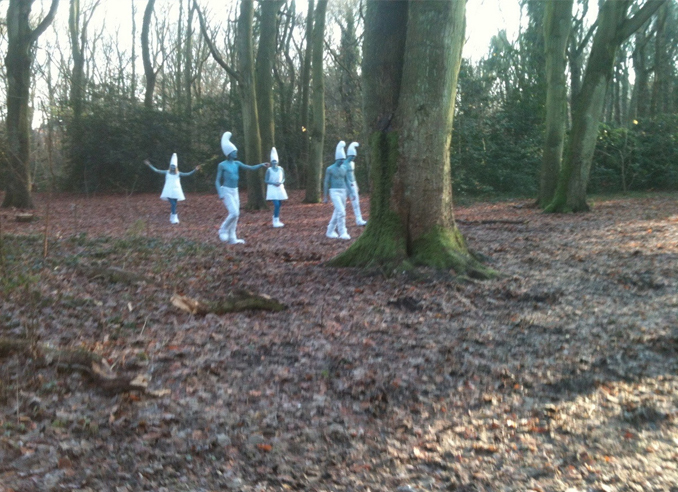 While the Smurfs seen in the photo are clearly five humans dressed in white clothes with their skin painted blue, it does make you wonder why they were strolling around in the woods in the first place? What were the Smurfs up to? Were they just taking in the fresh mountain air or could they have been up to something more sinister? And why was there two Smurfettes? Let us know what you think was going on in the comments section below. 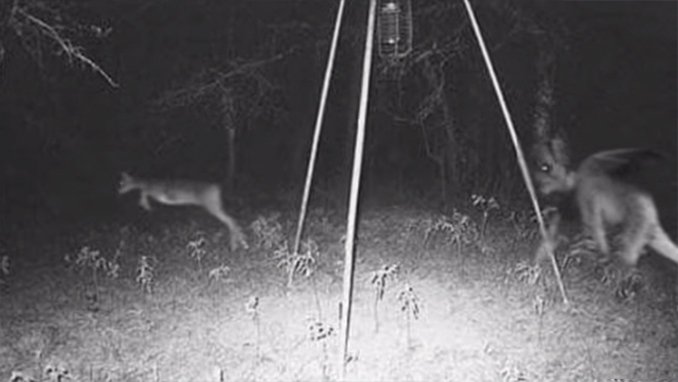 This photo, captured on a trail cam shows a strange creature chasing a deer through the forest. 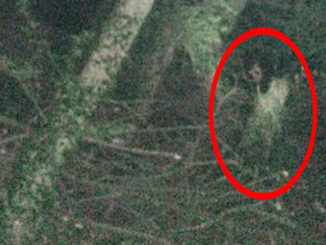 The creature seen in this picture is believed by many to be the infamous Jersey Devil. A beast said to roam the Pine Barrens of Southern New Jersey. It is described as a large winged creature with a head like a goat, legs like a bird and a long, pointed tail. The origins of the Jersey Devil are somewhat lost in time however a story from the early 1700’s tells of a woman named Jane Leeds who, shortly before the birth of her 13th child was said to exclaim “Let this child be a Devil!” When the child was born, it flew away, escaping into the woods of the nearby Pine Barrens. Since then many have claimed to have had encounters with the mysterious beast. Even Napoleon Bonaparte’s elder brother Joseph, was reported to have seen the Jersey Devil when he lived in New Jersey during the 1800’s. In 1925, a farmer reportedly shot and killed a strange creature that had been eating his chickens. 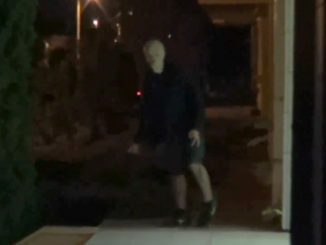 He was said to have showed it to more than one hundred people yet no one was able to identify the creature. Many believe that it could have been a Jersey Devil. By the mid 1950’s sightings of the Jersey Devil became so common that wealthy merchants offered a $250,000 reward for the capture of the beast. 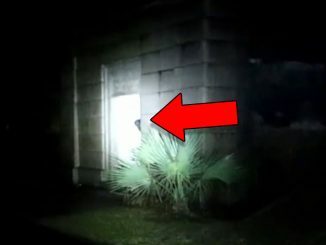 Many people who have recently reported to have seen the creature believe that it is not actually supernatural but rather some sort of strange cryptid that has yet to be classified. 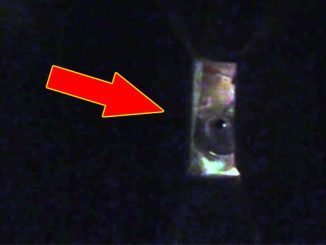 What do you think the creature in this trail cam photo could be? 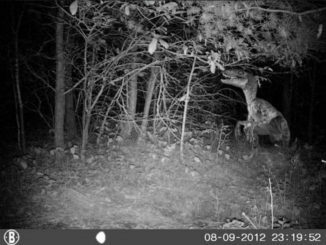 Is it the Jersey Devil, or could it be something else? 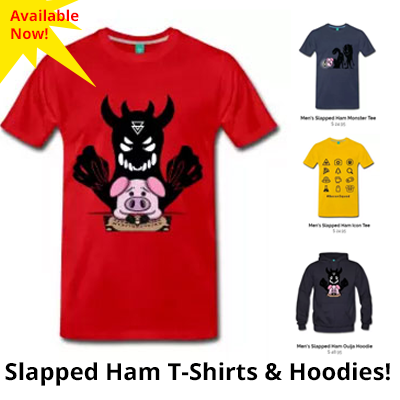 Let us know in the comments section below.